It’s an interesting time for Nike’s performance footwear at the moment. That Flyknit collar that the Magista ushered in back in 2014 has begun to make its way into other sporting categories and not necessarily the categories you’d first think of. Koston has taken it into skateboarding with his Nike SB Koston 3 and the Nike LunarEpic brings it to running. In all honesty, it’s taken them long enough to make the transition(s), but as I discovered when talking to Phil McCartney, VP of Running Footwear, this was for good reason. 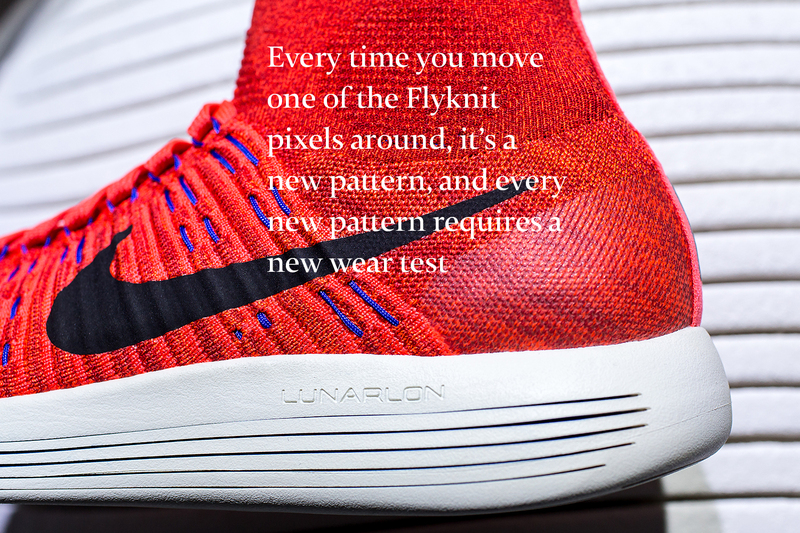 Although the Flyknit collar is the most visibly ostentatious element on the LunarEpic, it’s the laser siping on the Lunarlon midsole that is the most exciting development. It may not sound too innovative at first, but when I started getting into the details of it with Phil it became clear that this was a big move forward for Nike and that this shoe is very much the tip of the iceberg in regards to potential for this technology. Look beyond this shoe and you can begin to imagine a world in the not too distant future where every NikeTown or Nike running store has some form of NIKEiD that goes beyond aesthetic customisation and enters a realm of true performance customisation, taking measurements of the pressure areas of your foot and tweaking the siping in the Lunarlon to your specifications. 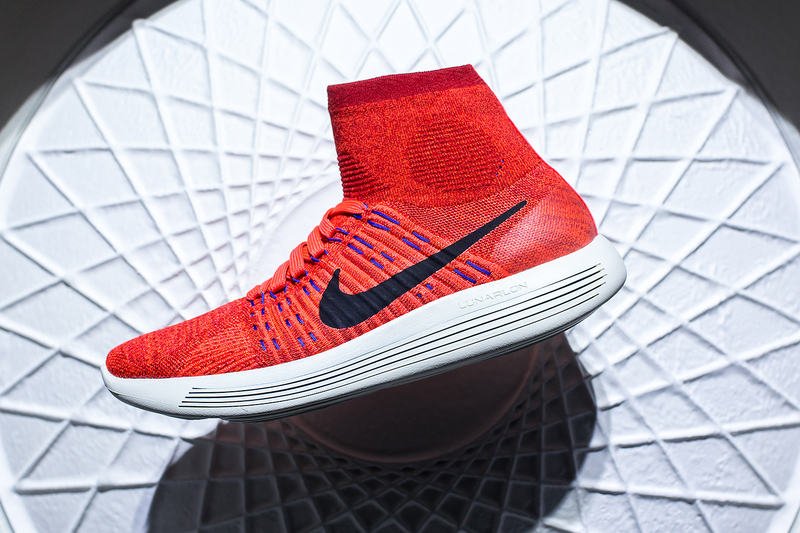 In theory, this too could become possible with Flyknit – a custom upper that is woven to give the right strength and flexibility where YOU need it, rather than where most people need it. It’ll come, that’s my prediction, it’s just a matter of time. When our conversation veered toward the possibilities of these technologies and customisation, Phil’s face lit up like a school child with a secret. There’s clearly something in the pipeline, even if it’s just an idea, but that idea alone has the potential to unlock a new age for running footwear and sneakers in general. If and when that world comes to be, you’ll want to remember this moment and this specific shoe as one of the key starting points. 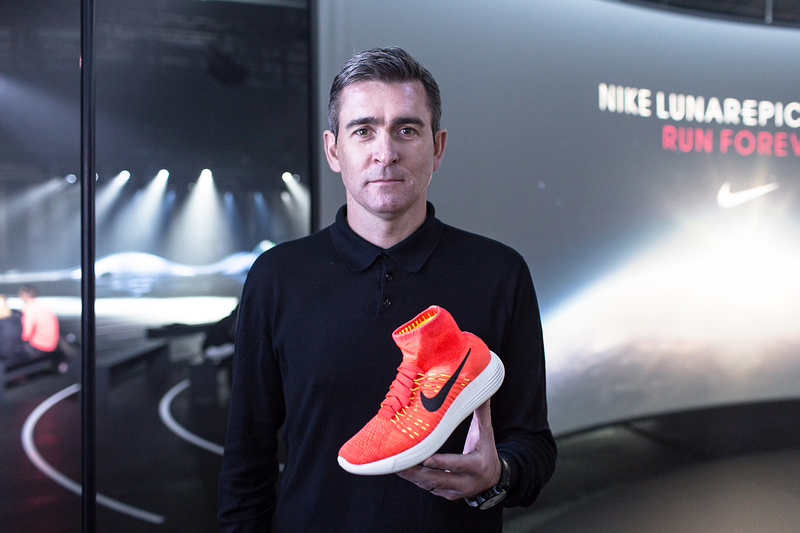 Could you give us some insight into your professional journey through Nike? I’m head of the running footwear division based in Beaverton, Oregon. I’ve been in the job for about 18 months. I was in running before, previous to this I was over all performance categories, and then I had a little stint at football as well. And is that where this has come from? Your time in football? How directly involved were you in bringing this innovation over to running? So I did a similar job in football and one of the things that I heard a lot from the players when we were developing this for the Mercurial and the Magista for Brazil 2014 was that sensation of fit. So when I came over to running, being a runner myself and knowing how obsessive runners are about fit, it seemed like something we should explore. And on a concept car like this, it felt like an area we could try something a little different to solve a real problem in an innovative way that runners would actually care about… once they put the shoe on. I think our challenge is we just need to get people to try the shoe on and get that sensation for themselves. To an extent, you must have faced similar problems when first introducing this innovation in football? Yeah, it’s a similar thing I think. Whenever something looks different, it needs to be a real legitimate performance reason why we’ve done that. I think honestly, there’s always a little bit of scepticism initially. We’re dealing with athletes and athletes tend to have a routine and think in a pretty linear way. I think that’s where the product’s got to speak for itself – the benefit’s got to be so intuitive and so functional that as soon as athletes put it on, they get it. We shouldn’t have to explain for ten minutes, they put them on, explain for another ten minutes and persuade them, it should be something instant and intuitive, which in football it really was. And the feedback we’ve had through wear testing and the media launch is a similar thing in running, which was that working hypothesis. I can guarantee you’ll have less scepticism than skateboarding, who have recently had this introduced via the Koston 3. 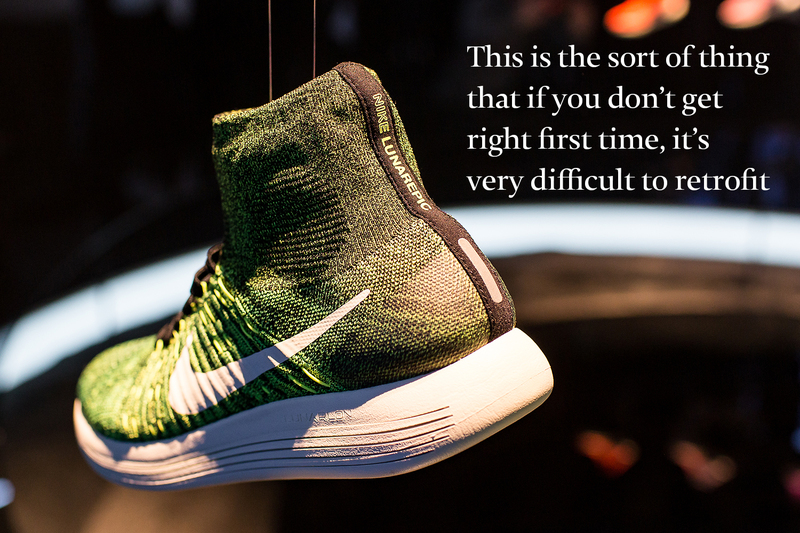 You know, honestly, I think our approach in running was… we’re trying to merge two pretty revolutionary new capabilities, with the laser siping and Flyknit with a motion fit collar. So for me it was really important that we did all the due diligence around testing and prototyping. We were really clear about the objectives when we came in to the project and from my point of view I was really conscious that we had to get it right. This is the sort of thing that if you don’t get right first time, it’s very difficult to retrofit and come back and say “Well actually, we’ve solved those problems now.” So we spent a lot of time wear testing, we spent a lot of time prototyping, we spent a lot of time in Asia working with our factory team mates to make sure that every single part is really truly precision engineered, so that’s why it’s taken us so long. I think it was more about getting it right rather than getting it fast. And how much of that process was the laser siping, and how much was the action fit collar? We were doing both together, so we actually ran parallel paths for about nine months because the way that we have to program Flyknit is pixel by pixel. It’s actually amazing to watch because it allows you to be really precise. 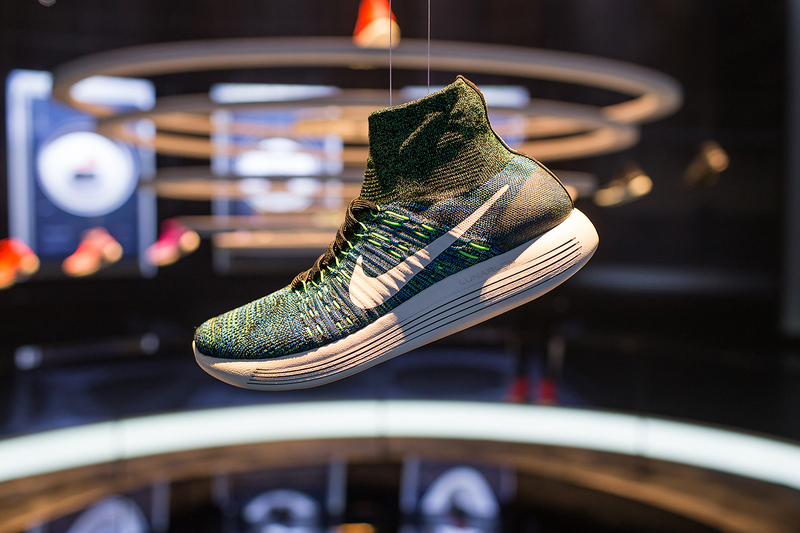 We have these amazing Flyknit programmers back in Beaverton and also in Asia. Every time you move one of the pixels around, it’s a new pattern, and every new pattern requires a new wear test, so we had a parallel path for that. And then this new laser capability was kind of a similar thing: fine tuning it. The good thing was that we were able to do a lot of rapid prototyping because you’ve got a blank, if you like, that you’re then laser siping, and you can do it lots of different ways and it’s pretty quick. Same thing with Flyknit. So we had a parallel path for a while, but we were always putting them back together for a prototype. We had different variables – we’d run three lays of siping patterns and three upper patterns, but we’d always have a control from a previous round – it’s a pretty involved process. This is the first shoe you’ve done with laser siping. When did you become aware of that technology? One of our factory team mates, we were just talking about our desire to be more precise and think about new capabilities in order to think about foot strike in a new way and think about how we could create a product that worked with the foot a little bit more naturally, and they brought that idea to the table. They kind of said “What you’re trying to get at is getting in and almost pixel by pixel think about the midsole the same way that you think about the upper.” So they came with a really huge laser machine that shot the laser down, it didn’t move, so we had to go in and manually move it, and now we work with a five head axis, which enables us to move the shoe and reduce the cycle time. It just gets better and better. Is that process entirely done in Asia, or do you have a prototyping machine in the Kitchen in Portland? No it’s all done in Asia, which actually sounds more cumbersome than it is, because it’s so fast we’re not having to cut new tooling every time so we’re not doing new steel. So we can just send them a programme, an idea, a design, and they can spin it pretty quickly. We spent a lot of time in Asia working on this. Does that speed give you significantly more room for experimentation then? Yeah. 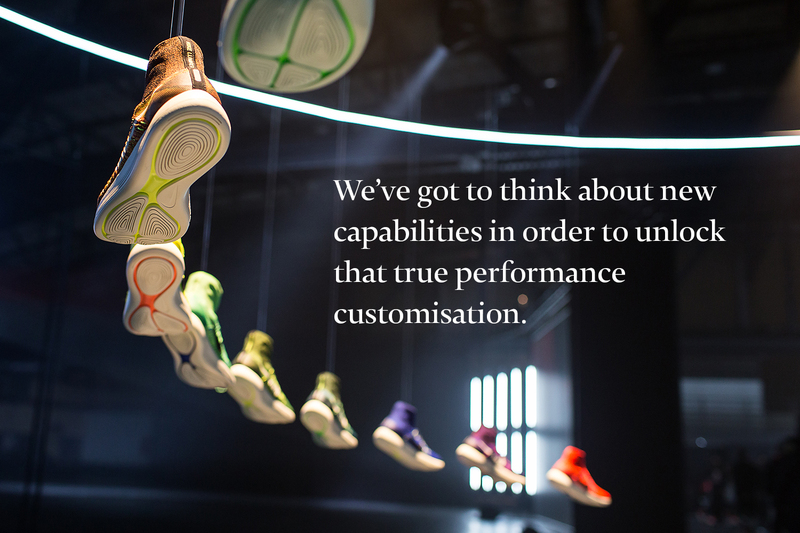 And we’re also starting to think now about not only how we experiment on one product, on one shoe, but also what that means to more customised product further down the line. Yeah, when you started talking about the laser machine I did think how maybe there’s a future where people could have that laser siping done specifically for their build. Is that a realistic area where Nike is heading? Yeah. Yeah [laughs]… is the short answer. One of the things we’re looking at is that when you think about foot strike, people kind of fall into six zones and we can programme an algorithm based on what zone you’re in. The idea would be that we could take a pressure map of your foot during foot strike, put you into one of the six algorithms, press a button, and that is lasered for you there and then, which is a similar capability that we have with Flyknit, so when you start to fast forward what that looks like in terms of a more personal, customised product solution, it’s pretty exciting. Yeah, for sure. 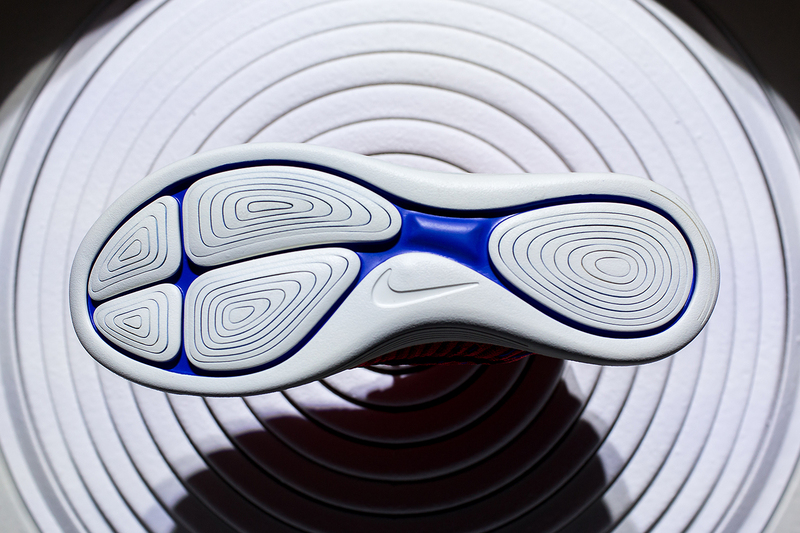 That would really interesting – to take the idea of NIKEiD beyond aesthetics and into performance. Yeah. Performance customisation is a zone that we’re really investing in and I think that these capabilities start to really unlock that. It’s really hard to do with old capabilities or existing capabilities, we’ve got to think about new capabilities in order to unlock that true performance customisation. Both these things would allow us to explore that, which we’re doing. The outsole, it’s shape, and the use of laser siping there – where does the inspiration for that come from? It looks very animalistic. We looked at pressure maps, so what happens naturally during gates, and where you’d want cushioning, where you want the right level of protection, where you want the right level of support. So we used a foot pressure map to inspire this. And the laser siping allows us to get in and be really precise with how we do that. That was our original inspiration. And then I think just more organic, generally, which I think allows us to mimic more the anatomical structure and function of the foot. How much of the siping technology featured on this shoe did you learn from what you’ve been doing with Free over the last decade and a half? In terms of philosophically the benefit of something working more with your foot, yeah. In terms of how we do that, it’s very different. The way that we do Free is typically in mold, or we use blades, this is far more precise and I think that’s why as a capability it’s just really exciting for us. When you start thinking about the application… we’ve tuned this based on what we’re trying to deliver in Run Easy, but you can quite quickly get to what you’d do to make it a faster experience or to make it a more natural experience, which we’re thinking a lot about now. I have a few piles of prototypes [smiles]. The collar obviously came originally from football and has already spread into another three categories at Nike (basketball, skateboarding, running). Do you see this laser siping spreading in a similar way across to other categories outside of running? I think at the minute we’re focused on how we’d scale it in running. These things, it’s really important to get them right, to tune them in the right way. I do think it has benefit across multiple categories – it’s one of those unlocks from the capability and the technology stand point that allows you to do a lot of different things, so I’d imagine they’ll start to use this benefit in other zones. But I think for us as a team, we’re just really focused on continuing to build this, and then also to think about its application just in the running devision.